Learn more practical skills than you might have imagined. and all by distance education. There is much less certainty today about the best method to prune a fruit tree than what there was twenty years ago. In the past, fruit trees have traditionally been pruned in the shape of an inverted cone (called a vase shape). Experimentation has shown that several other techniques can be just as productive as the vase system. With better watering, fertilizing and weed control, trees are today able to carry a lot more fruit than they could a few decades ago. Consequently, the detailed, heavy pruning of the past is not always practiced these days. In the home orchard, pruning can largely be adapted to shape the tree so that it fits into the general function and design of your overall garden. If you want to prune so that you can walk under or past one side of your fruit tree, this is acceptable. Prior to pruning, look closely at the tree and try to understand how it grows. What parts of the tree produce flowers & fruit? What shape do you want to achieve, do you want small fruit or larger but less fruit? Deciduous fruit trees are usually pruned in winter because the tree is bare of leaves and it is easier at that time to see what you are cutting. Evergreens are often left until the summer or early autumn depending on the variety of tree when it fruits and the climate you live in. 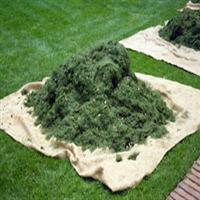 You would not want to prune an evergreen tree in the middle of frosty winters. Note the size of the buds. Larger, plump buds are flower/fruit buds. Narrower buds are vegetative (ie: Vegetative buds give rise to leaves or green shoots). The frequency of flower buds will give an indication of the amount of fruit the tree is likely to bear (Note: On some types of trees, one bud can produce several fruit; on others one bud only produces one fruit). You will notice that fruit buds are borne on particular parts of a tree (eg: Peaches bear fruit on 1 year old laterals; apples bear fruit on the tips of on year old laterals as well as in small clusters of compact growths called "spur systems"). The basis of your pruning should be to cut in a way which will encourage the development of the type of growth which will produce fruit for future years, but at the same time will leave sufficient fruit buds to allow a reasonable crop for the coming season. The vigor of the tree or shoot depends on the direction of growth and the amount of leaf surface (among other things). The more a shoot approaches the vertical position, the stronger it's growth will be. The top or terminal bud of a shoot generally has the greatest amount of growth. The growth potential of the buds will gradually decrease as you come closer to the base of a shoot and also to the base of the trunk. The greater the vegetative growth, the lighter the crop, resulting in larger but poorer quality fruit. The fewer the number of buds on a shoot, the stronger will be the growth made by each individual shoot arising from these buds. All fruit should be removed from young trees for the first few years after planting, to allow the leaf & stem growth to better develop. Always make sure all equipment is in good repair, suited to the job as well as sharp and clean.